(R.R.P. £139.99). Beautiful quality! A black tight leather mini skirt in an extra short, daring length (12-13in from top to bottom) and with a gorgeous red satin lining. An unashamedly plain and sleek style, it is a perfect length to wear with thigh-high boots and/or to reveal extra leg! It is crafted in super soft lambskin nappa leather, sourced from British hides and iss exquisitely tailored for a figure-hugging fit. It fastens with an attractive short golden metal zip at the rear with discrete popper stud. Tailored by Ashwood exclusively for Tout Ensemble. (R.R.P. £139.99). A tight leather mini skirt in an extra short, revealing length – perfect for your thigh boots and/or to show off your legs. It is exquisitely tailored in luxury soft lambskin nappa, sourced exclusively from British hides, for a figure-hugging fit. 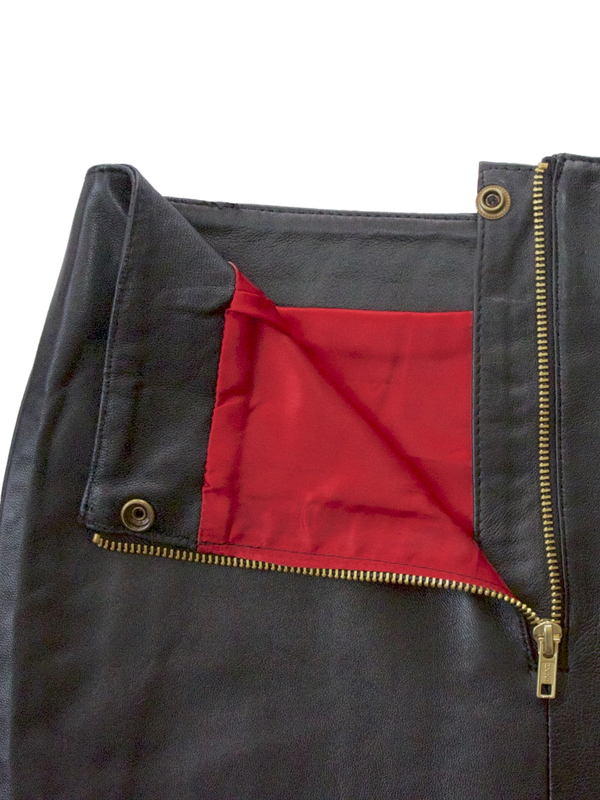 The black leather skirt fastens at the rear with a gold-coloured metal zip, and has a fabulous red satin lining (100% polyester). (RRP £179.99). A fantastic leather hipster mini skirt, superbly tailored in fine quality tan lambskin nappa styled with vertical strips sewn together. It has a wide leather waistband with belt loops and belt with buckle fastening. Length 14in-16in. Fully lined. Made by Ashwood. Please read our Product Description below for full details and important sizing information. (RRP £149.99). Figure-hugging tight leather mini skirt (14.5in length) with front popper stud fastening - leave some open to show more of your legs! Made in soft lambskin nappa leather, it is beautifully tailored to sit on waist with a close-fitting waistband. Belt loops and two back pockets. Exclusive to Tout Ensemble by Ashwood. Available in black, red, tan and burgundy. Please see our Product Description below for full details and important sizing information. (RRP £199.99). A lovely little figure-hugging leather mini skirt with a short fringed slanted hemline. Made in lightweight fine soft lambskin nappa, it is perfect for the warmer weather too. Length 13in-15in - short enough to wear with thigh boots or show lots of leg. Made exclusively for Tout Ensemble by Ashwood. Available in black, red or white, in sizes up to 30in waist. Please read our Product Description below for full details and important sizing information.